Here we are back visiting our chosen garden each month, with our garden for 2018 being the attached garden at The Dingle Nurseries near Welshpool. 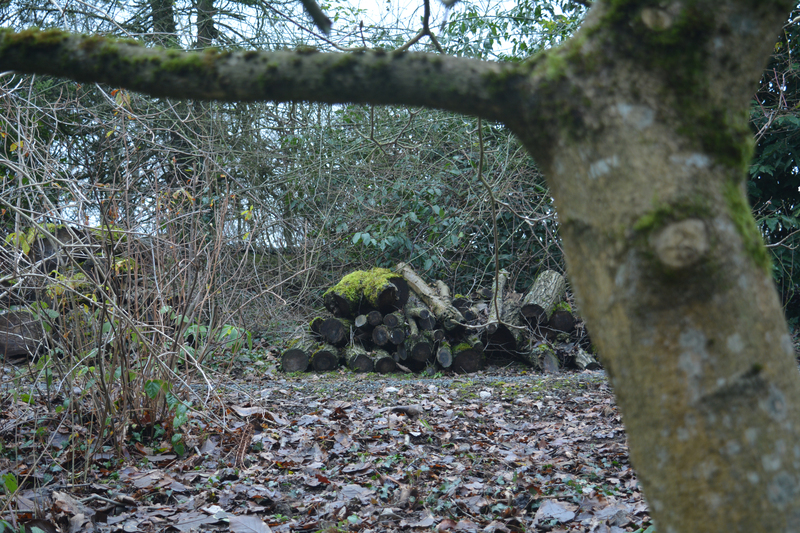 This garden is of a totally different scale, atmosphere and style to Attingham Park, our garden for 2017. 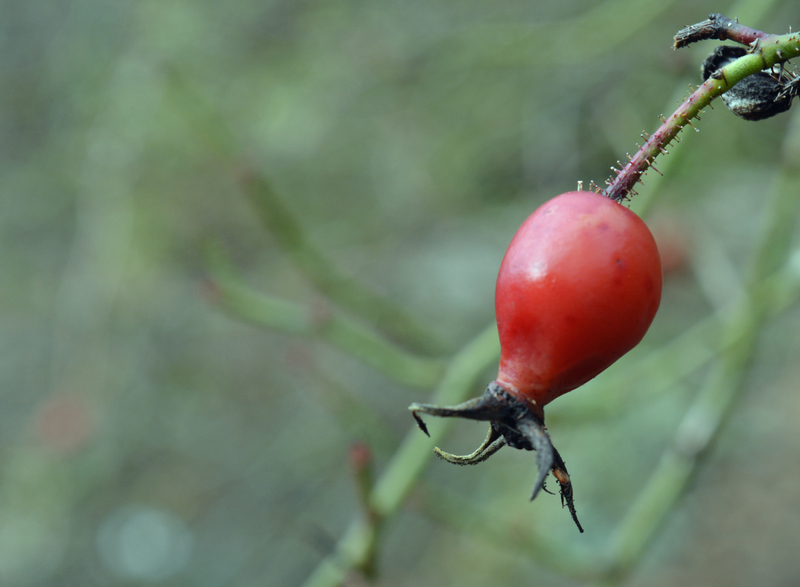 The garden is open every day of the year bar Christmas Day and on odd days the fees go to the National Garden Scheme. 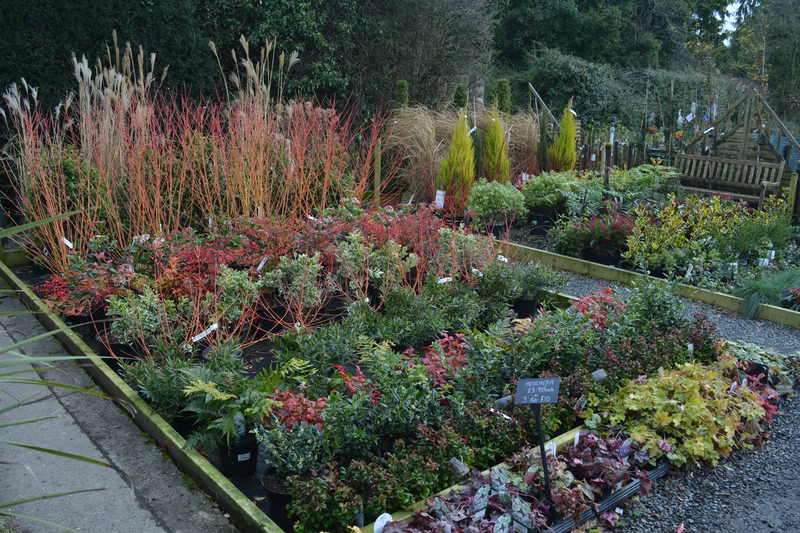 The nursery is stocked with perennials, shrubs and trees but specialises mostly in the last two, and it is from here that we tend to buy our trees and shrubs. This is a nursery we are delighted to have on our dooorstep. 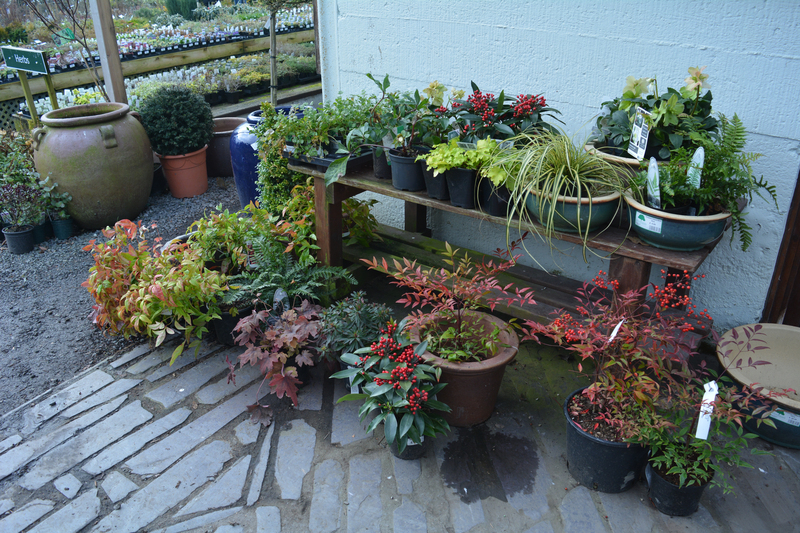 As we move through the entrance we always enjoy the displays of plants with current interest and similarly plants for winter interest and displayed in the first few rows of plants. 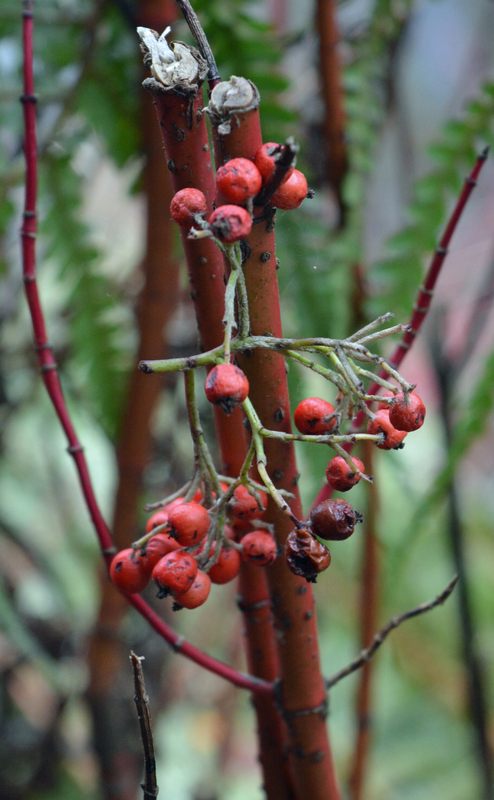 So, here we are on the 14th January with our first visit to our new garden, arriving on a dull lightly overcast day. 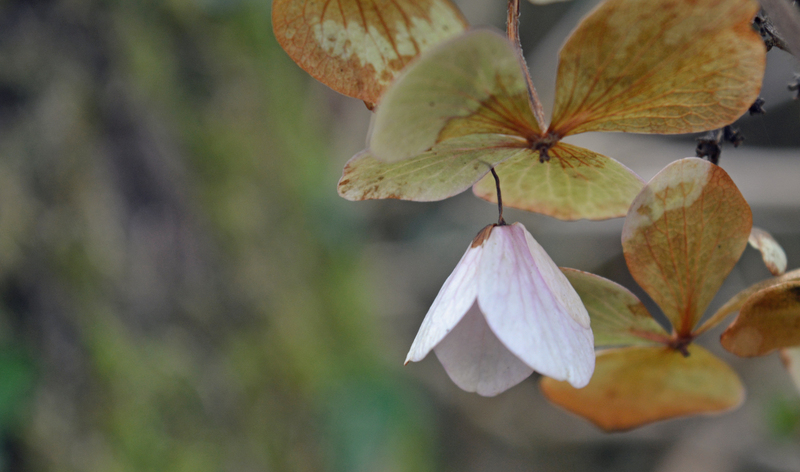 Having never visited before this deep into winter, we entered through the wooden gate green with algae and followed the gravel paths into the garden, not quite knowing what to expect. 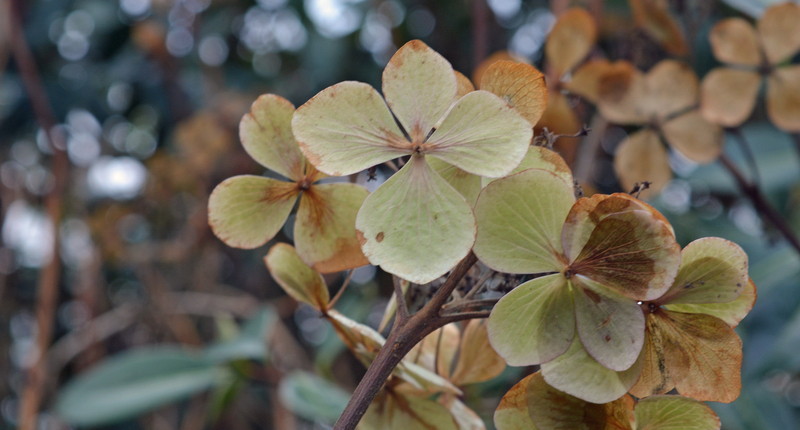 We enjoy surprises in the gardens we visit! 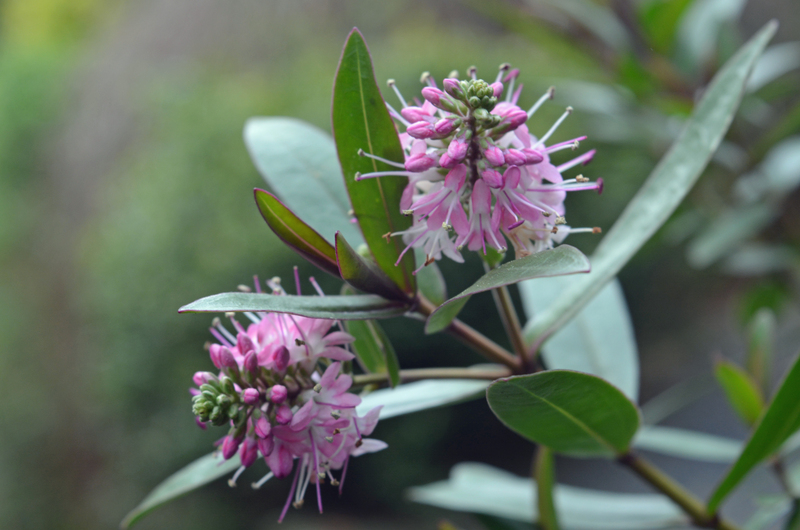 Evergreens both coniferous and broadleaves lined the paths and are planted in thoughtful groupings. 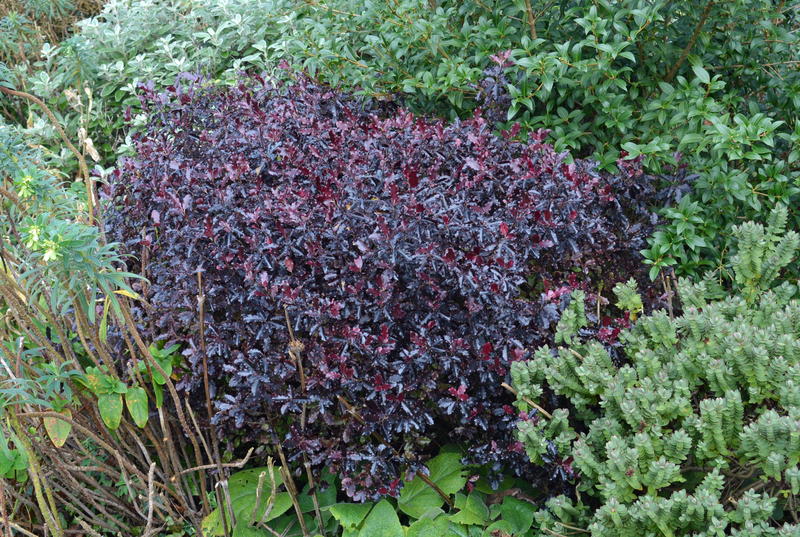 In the first photo a dark, glossy leaved Pittosporum “Tom Thumb” sits comfortably with a Euphorbia, a Brachyglottis and a Hebe. 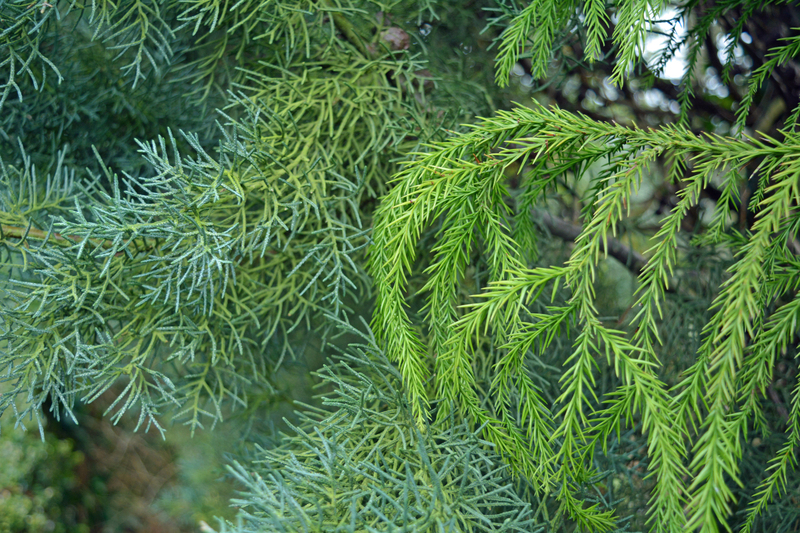 In the second picture two conifers illustrate how different they can be in texture, colour and form. 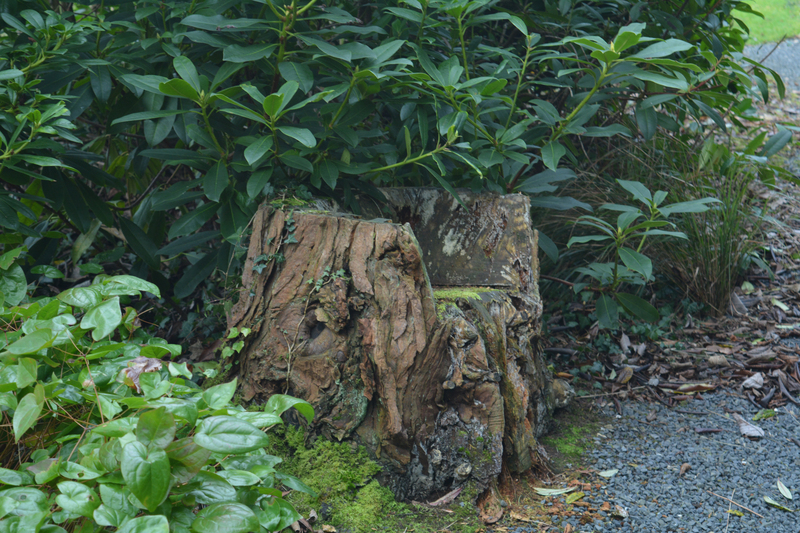 Early in our wanderings we found this lovely rustic seat which is slowly being eroded away by the weather. 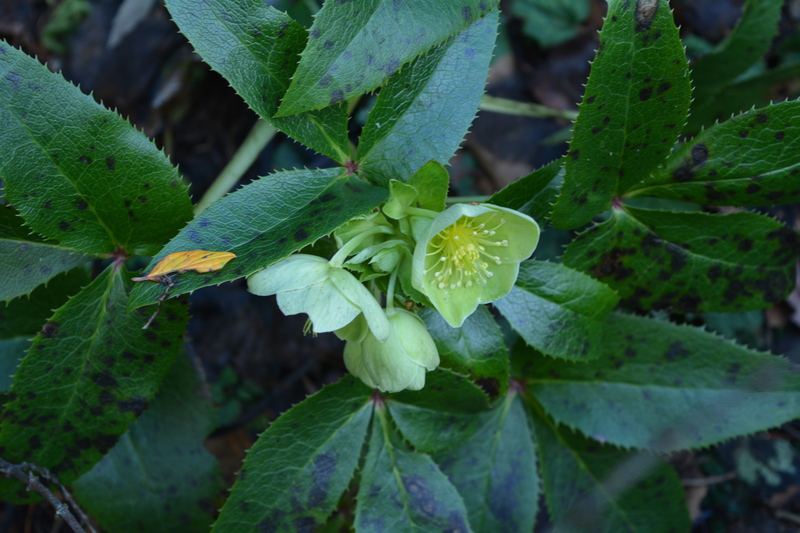 Close by the seat glowed the pale green flowers of a Helleborus foetidus. 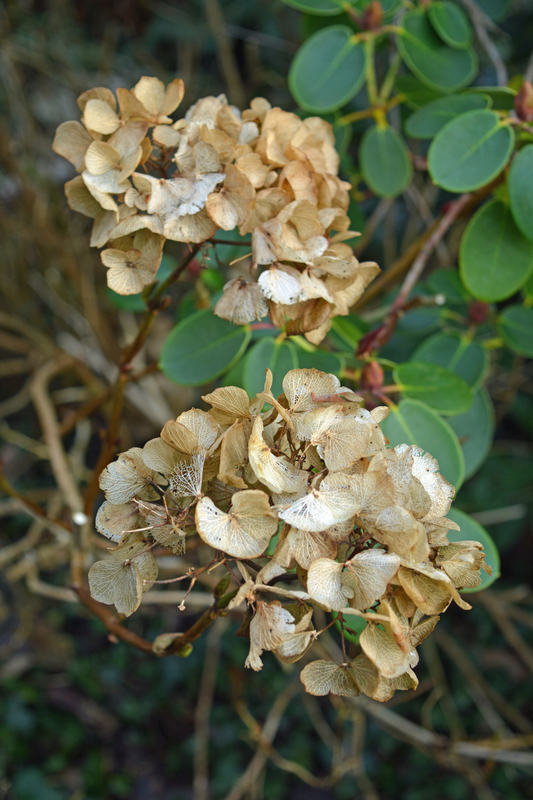 Hydrangeas appear throughout the garden in the autumn showing their colourful inflorescences in pinks, white and blues, while throughout the winter these colours fade to biscuits, gingers and ivory. 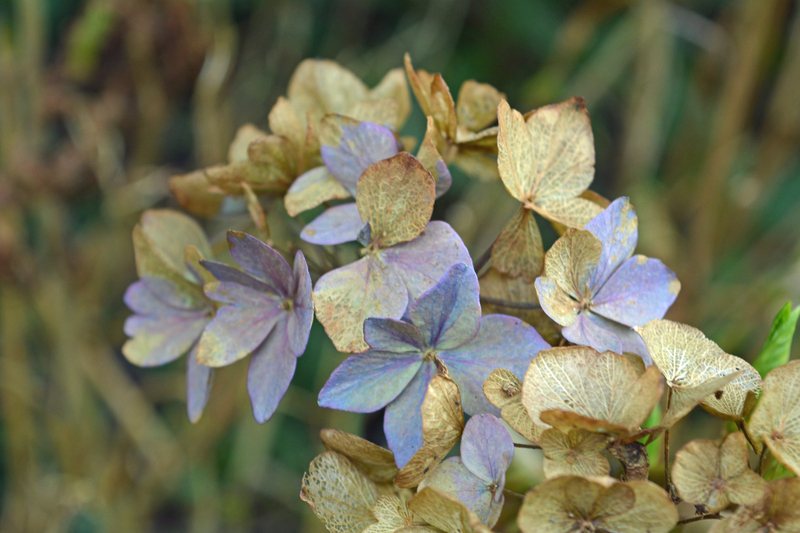 In some flowers hints of blues and pinks remain. 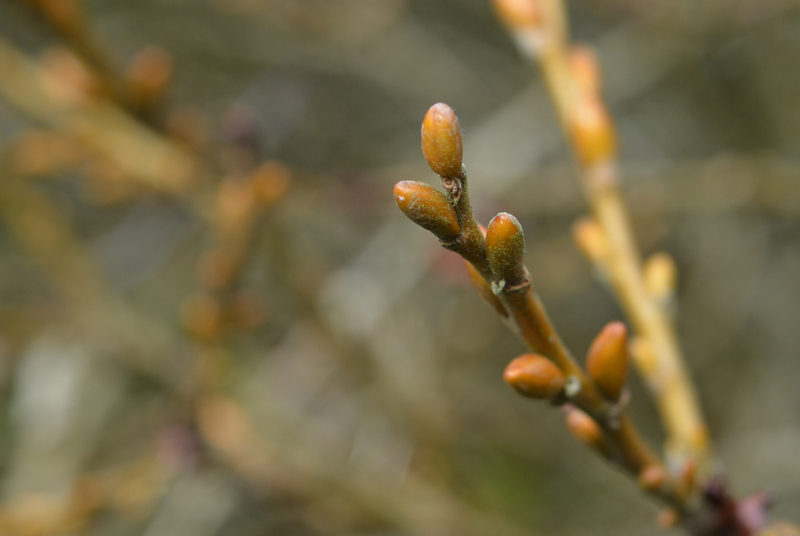 Out of season flowers appear here and there on odd shrubs, on others leaf buds promise fresh growth in the spring while berries hang as remnants of their winter harvest. 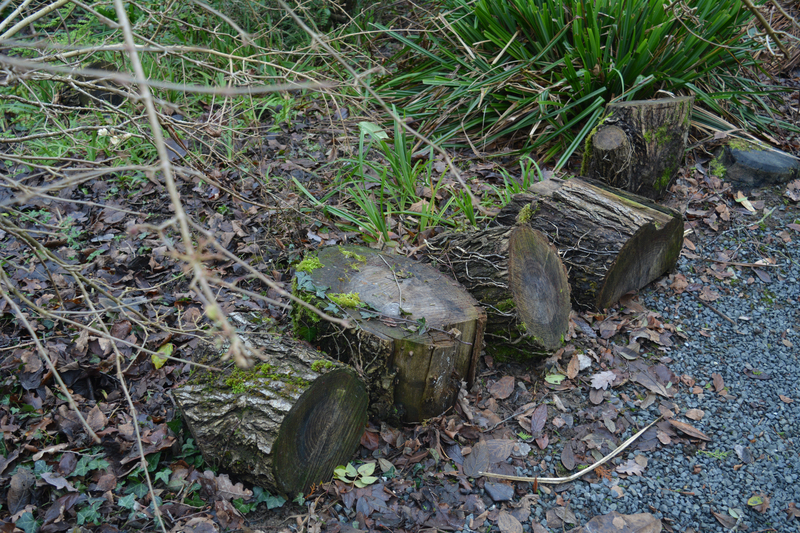 When tree surgery work is carried out in the Dingle Garden logs are left as habitats for the many forms of wildlife that maintain a healthy ecosystem in the garden. 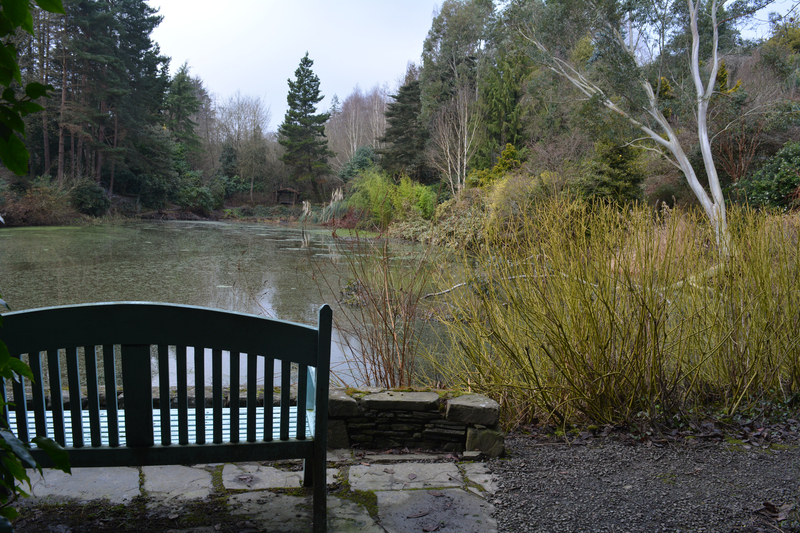 At the lowest point of the gardens a calm lake affords us a place to stop awhile to look around its banks. 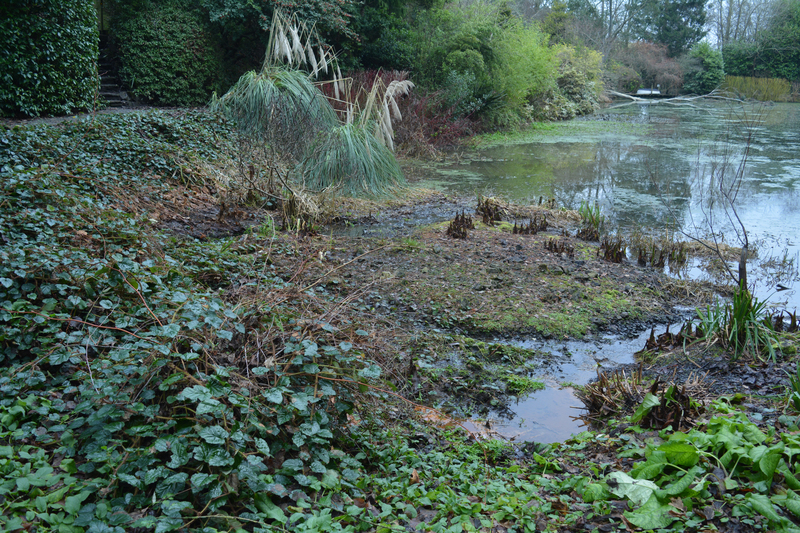 A bog garden at one end looks dull and dark at this time of year, with just the deep brown of dead leaves of Gunnera and Lysichiton americanus rising above the mud. 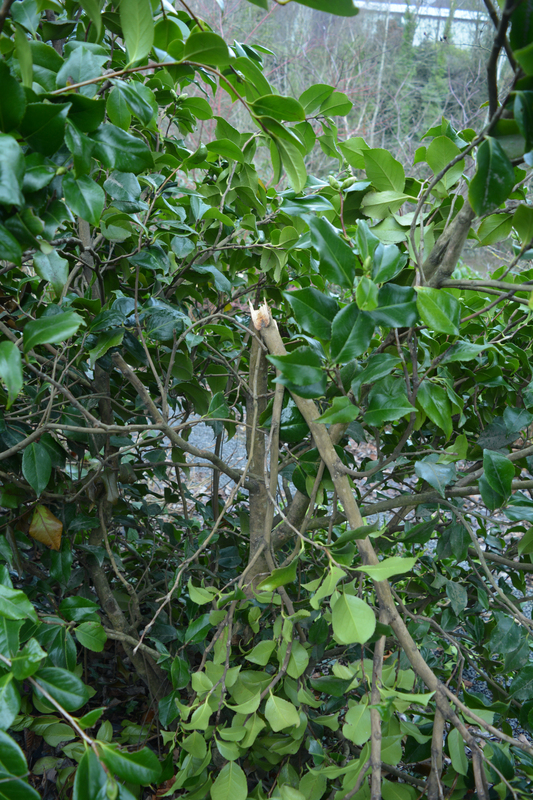 Recent heavy snowfall has caused damage to trees and shrubs, breaking branches of all sizes and crushing foliage. 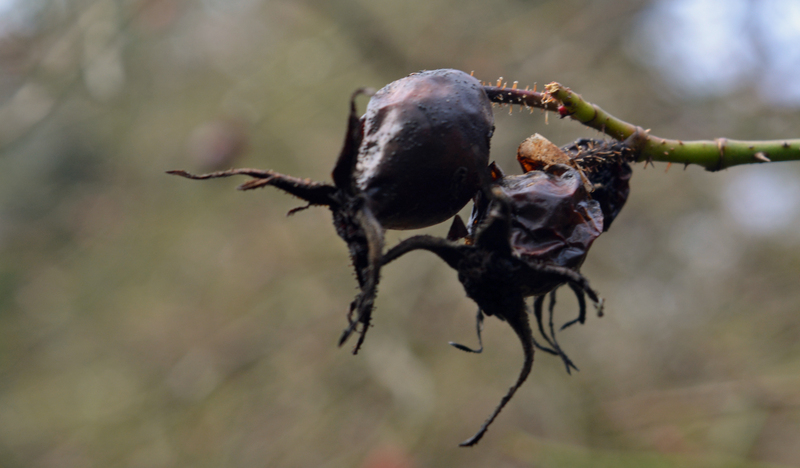 Strong winter winds have added to the damage. 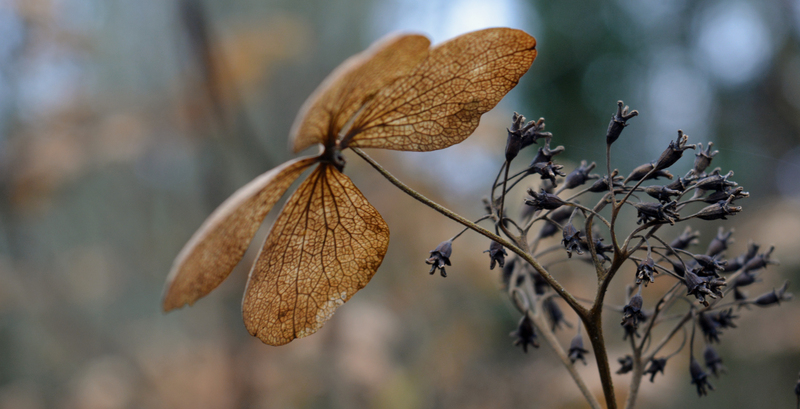 To share more of my photos taken during our wandering and enjoyment of the gardens at the Dingle I have created the following gallery. Enjoy the pictures. 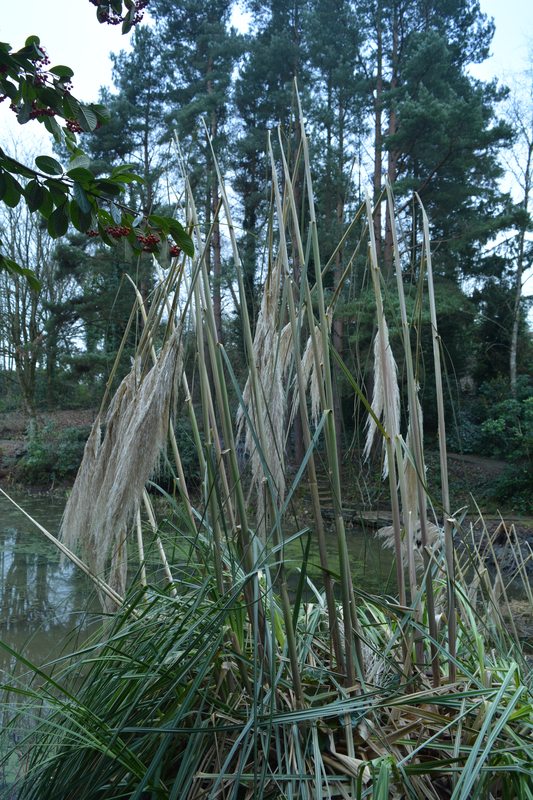 The next visit to this garden will be in February. This entry was posted in colours, garden design, garden photography, garden ponds, gardening, gardens, gardens open to the public, light, log piles, National Garden Scheme, NGS, nurseries, ornamental trees and shrubs, outdoor sculpture, Powis, Powys, shrubs, trees, Wales, Winter Gardening, winter gardens, Yellow Book Gardens and tagged conifers, evergreens, gardens of Powys, ornamental shrubs, ornamental trees, Powis, Powys, shrubs and trees, The Dingle Welshpool, Welsh gardens, Welshpool. Bookmark the permalink.